In Myths of the World: Spirit Wolf, you’re called to a Native American education center to provide your expertise on some strange happenings. An amulet that was a family heirloom, and is always with you, begins to glow and interact with the site and piques your interest. 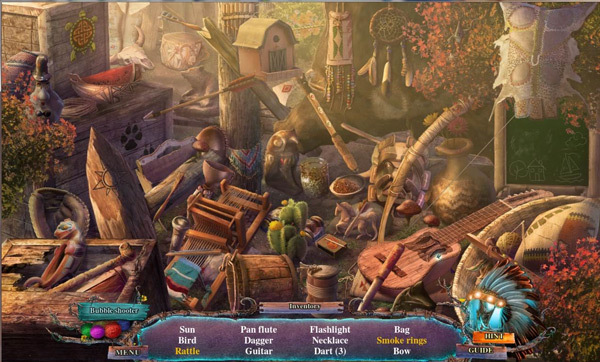 Uncover the ghosts of the past and find out what has brought their spirits back in this gorgeous hidden object adventure game! As a fan of the Myths of the World series by Eipix, I was extremely excited to see another game in the franchise hit the new releases section. And Myths of the World: Spirit Wolf did not disappoint! Crisp graphics, an interesting color palette, and an appealing storyline come together to provide a great gaming experience. The animation is surprisingly lifelike and even the voice-overs are well done. The main character may be a tad over the top/dramatic, but overall the cut scenes are on par with the quality of the game. The special effect sounds and background music are fitting, and I didn’t turn them down once! I think what drew me in the most were the colors – appropriate to the southwestern theme, the shades of sand and terracotta mixed well with the bright turquoise to create some stunning visuals. The spirit wolf himself in a ghostly translucent blue was eye-catching and beautifully done. Myths of the World: Spirit Wolf follows you, an expert on Native American symbolism, to your friend’s cultural center where strange things are happening. When you arrive, you notice that your amulet, which has been passed down for generations, begins glowing much like the blue glyphs around the center. As you begin to investigate, you uncover ghosts of the past civilization who are calling on you for help. 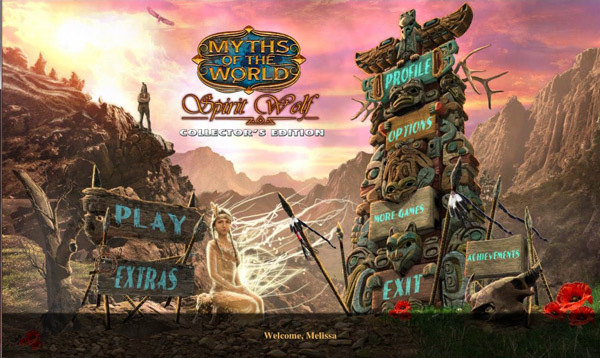 Myths of the World: Spirit Wolf Collector’s Edition contains all the extra bling you expect in a CE – tons of extras; bonus chapters, completely customizable game play, achievements, and collectibles. While I don’t necessarily take full advantage of some of the bonuses and extras, I’m beginning to like the collectibles and achievements more. I also appreciate the ability to customize the level of difficulty rather than choosing a pre-set combination. I might like to use the hint or skip features occasionally, but I don’t really care for sparkles guiding my play. There is the always useful interactive map to help you jump between scenes and determine where action is needed. The integrated strategy guide can help if you are stumped on a scene or one of the HOS or mini-games. 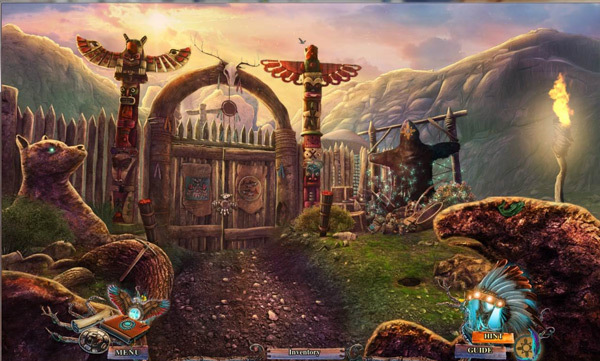 The hidden object scenes encountered in Myths of the World: Spirit Wolf were refreshing to me – from the earthy color palette to the Native American themed objects, I found them far more enjoyable than the typical dark and cluttered piles of junk. The HOS keep it interesting incorporating basic lists, silhouettes, and multiples throughout the scenes. You also have the unique option of trading an HOS for a bubble popping game – which may be a guilty pleasure of mine, right up there with match 3 games. 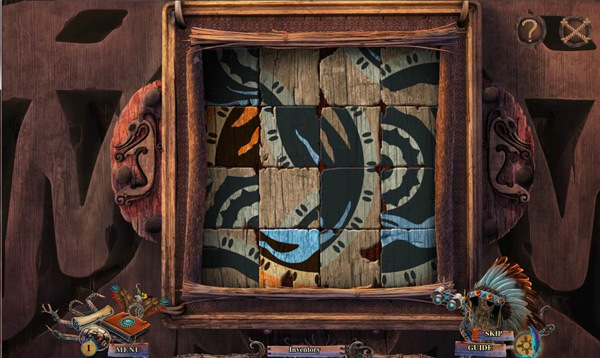 Myths of the World: Spirit Wolf incorporates 23 mini-games, which are really pretty easy and standard. If I had to suggest one edit to the game, I would have liked to have seen a little more challenge in the games. But, it wasn’t enough to detract from the overall phenomenal game experience presented by Eipix. It’s a good compromise to allow multiple levels of players to enjoy the same game. 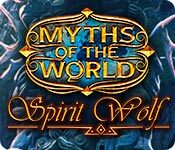 The developers have really done a great job with Myths of the World: Spirit Wolf, and I look forward to seeing what they come out with next!